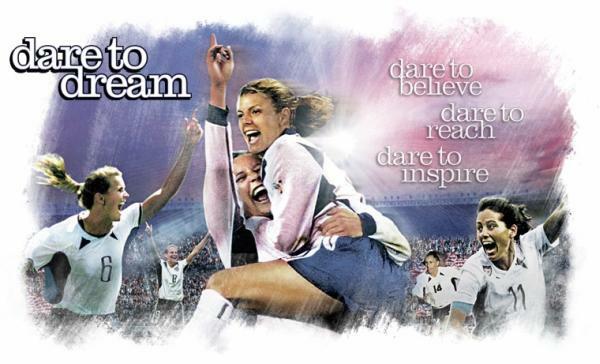 ‘Dare to Dream’ is a TV documentary produced by HBO of the farewell tour hosted for the golden generation of football players for US Women’s National TEAM (USWNT). Amongst the key players included were Brandi Chastain, Mia Hamm, Julie Foudy, Kristine Lilly and Joy Fawcett. 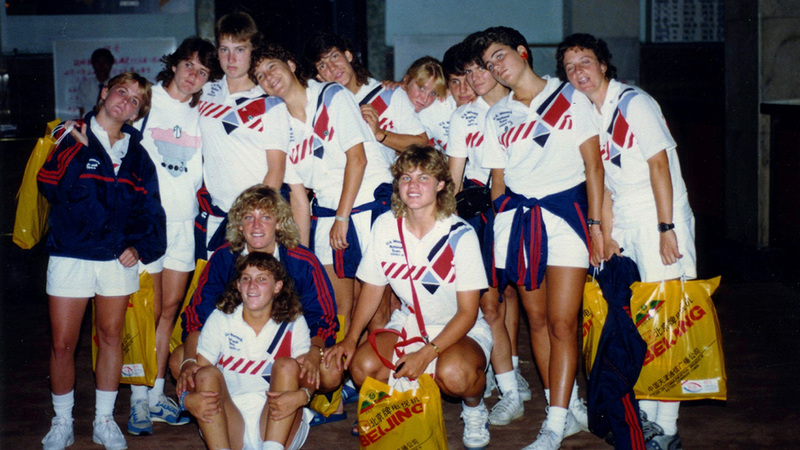 They were known as the 91ers (as well as the 99ers for their winning exploits at the 1999 FIFA Women’s World Cup; more on this later), for that was the year they basically came from nowhere to win the World Cup for the first time. It was the first time any United States football national team at any level have even reached a final, let alone win something, so it was a hugely gratifying success for those involved…if only everyone else had cared. In watching this documentary, it was somewhat sad to hear of the assistant coach, Tony DiCicco, noted how disappointing it was to be greeted only by three people upon landing in the United States. The most famous sports bra in history. You have to understand, though, that my first exposure to the team relates back to the 1999 edition of the tournament, when the team defeated the Chinese national team on penalties in the final. Upon scoring the winning penalty, Brandi Chastain whipped off her shirt in celebration, revealing a black sports bra that called much attention to itself at the time. Many comments have been passed, but for me, the image stuck primarily because even in victory she looked somewhat angry. Of course, it was not intended as such, but watching this documentary contextualises that moment. Theirs have been a topsy-turvy journey, but I must admit that in the context of structuring the storytelling of this documentary, it could be argued that the team had too much success. We basically traverse through events chronologically, interspersed with bits of the players themselves (Fawcett, Hamm and Foudy retired after the last match of the tour) as they prepare for the final day of their national team careers. Their impact can clearly be seen, with even current stars like Abby Wambach paying credit to these golden girls. Back to the structure. I say that they probably have too much success because the story was told in a fairly straightforward way, which highlights their efforts in many different tournaments. Perhaps not as much attention is paid to the actual struggle (what kind of food do athlete’s eat on $10 coupons? ), but there certainly were many victories that served as climaxes; in addition to the 1999 World Cup win, this team also secured the top spot on the podium at the 1996 and 2004 Olympics. While there is nothing wrong with this, the repetition of the build-ups and climaxes makes me care less for each subsequent one. Like they said, some things like the 80s shouldn’t happen. For example, the way the Olympic victories were presented felt a little underwhelming; as I recall it now, at the 2000 Olympics they only managed a silver medal due to a contentious decision, and one of the players were angered enough by the decision to describe it as the taking away of their dream. Perhaps I am being a little cynical here, but by that point they had won two World Cups and one Olympic gold medal (in front of their home crowd, no less); beyond a fierce competitive spirit, I wonder how much of a dream it actually really is. Then again, like I said, this is a TV production, and I highly doubt a radical altering of conventional storytelling structures along the lines of emotional journeys was what the doctor ordered. That’s fair, and as mentioned earlier documentary remained enlightening nonetheless. I enjoyed seeing the spirit and camaraderie that existed amongst the key players of the team. This is a fairly peculiar aspect of the United States national teams, even for the men prior to the existence of Major League Soccer, as the team tend to stay and play together a lot of the time. For example, Lilly has a batshit mental total of over 350 caps, while Hamm herself has scored over 150 goals for the team; at one point, that was the most anyone had scored for any national team, ever. 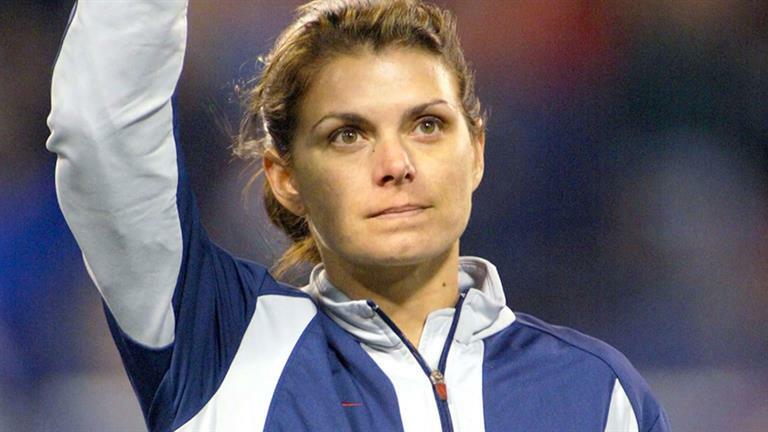 I was also unaware of Billie Jean King’s role in a key moment in the team’s history, and to hear Mia Hamm describe the influence of her late brother on her was very moving. Beyond that, I also appreciated the little moments when the team supported each other. Fawcett took a break from the team early on to have a baby, and her child would soon join the team on their tours upon her return. On one trip, her daughter, who had been potty training, apologised for wetting herself. “Mom, I just lost focus.” I couldn’t help but laugh at that, and it is such moments I look for in these documentaries, the kind of stuff you can’t really find on Wikipedia entries. As an aside, it highlights a very interesting group of women grouped together at a specific time. It shows as well how they struggled against gender discrimination at various levels. It took winning the World Cup on home soil to really hammer home the fact that these are not only women, but professional athletes who deserve to be treated as such. For a long time, football in the United States have largely been seen as a girls-only hobby, but their efforts (along with that of the men’s national team in reaching the 2002 World Cup quarter-final) helped to break down plenty of barriers. I can’t quite claim this to be the perfect documentary, though. Being a TV production, I understand the need for music to be present a lot, but having it on all the time also took away a bit more of the emotions from certain scenes, when a quieter approach would have maximised the impact, in my opinion. It does, make me realise how old I am: in one scene, the team sang Ricky Martin’s ‘Livin’ La Vida Loca’ in their locker rooms. 1999 was 15 years ago. Bloody hell. Fikri can’t believe 15 years went by just like…that.